Apollonius of Tyana : Apollonius was in Palestine in his early 30s !! This commentary follows on from yesterday's post about Apollonius' travels. We find out, from running a timeline based on Apollonius' age, that there is a good possibility that he was in Roman Judea (Palestine) for a period of around 3-5 years, at the same time the Roman-created "Iesus Christus" was supposedly travelling around the area. What are the odds that both Apollonius and "Jesus Christ" were living and working around Palestine-Judea at exactly the same time, and yet they never met each other, never heard of each other, and their biographers never mentioned the other when writing up their histories? We have to come to the startling conclusion: Maybe one of them didn't exist! "Iudaea (Judea) Province in the First Century"
GRS Mead in "Apollonius of Tyana" (1901),: "Philostratus said Apollonius spent some time among the "Arabians" [after he had finished at 'philosophy school' in Ægae - BL] and had been instructed by them (1.20, 4.38). And by Arabia we are to understand the country south of Palestine, which was at this period a regular hot-bed of mystic communities. The spots he visited were in out-of-the-way places, where the spirit of holiness lingered, and not the crowded and disturbed cities, for the subject of his conversation, he said, required “men and not people.” [??] He spent his time in travelling from one to another of these temples, shrines, and commun-ities; from which we may conclude that there was some kind of common freemasonry [like the German Journeyman of today] as it were, among them, of the nature of initiation, which opened the door of hospitality to him." From what GRW Mead says in his "Apollonius of Tyana" (1901), Apollonius was around 28-33 years of age when he went to "Arabia". This may have been a "post-apprenticeship" journey consisting of a number of years' travel, such as we see to this day in the medieval tradition (from 5th century CE) of the German carpentary Journeyman. Approximately three years then, could well have been the length of time that Apollonius was in Arabia-Palestina (Judea). Does this co-incide with somebody else we know who was said to be teaching in Palestine at this same time? Did the Arabian-Palestinas hand down oral traditions and stories correctly therefore, of a wise, philosophic young man who performed healing miracles and offered compassionate advice to ordinary people? - a man with long uncut hair, as depicted in Christian iconography from its beginnings in 325 CE, right up to today? Is memory of this long-haired man that changed the world's thinking towards sovereignty and living free from an oppressor, still within the collective human consciousness today? 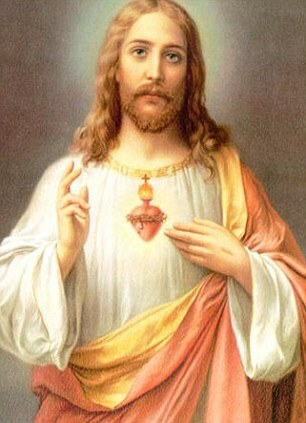 How is it that even modern painters "just know" that Jesus has long hair and is dressed in white? - They don't. But "something" is so firmly embedded in the collective human consciousness that they just couldn't conceive painting a Jesus with the short Jewish haircut. It's impossible. Please note: In Judaism, men have to cut their hair short lest they be seen as effeminate - so how could this long-haired man "Jesus" have been of Jewish origins, unless of course he had been to Pythagorean school? (Not likely). 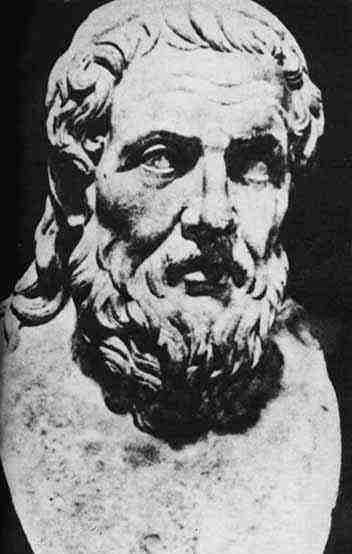 Since Apollonius was a Pythagorean Nazarean, he would wear no animal hide, so he walked with bare feet upon the ground as many indigenous nations do even today, and because he would wear no animal fibre, he only wore white linen. Linen is made from flax fibres after the fleshy layers have been broken down and scraped away. It is extremely durable and lasts for decades. In 325 CE in Nicea, did the Roman "Church Fathers" (the Roman elite patricians) decide to rename this visitor to 1st century Arabia-Palestina who had hailed from Asia Minor (modern day Turkey), as one "Iesus Christus"? Did they then reassemble those Apollonius stories from Arabia-Palestina and other places around the Mediterranean for their own liking and purpose? Were the deeds of the Turkish-Greek Apollonius which became centred around the region of Biblical Judea, now in need of a Jewish hero? Were these "Church Fathers" (men of these Roman elite families) compelled to do this because they had discovered the legend of Apollonius of Tyana in the Roman Empire was simply, unsuppressable? Was the only solution to merge Roman Mithraism and the ever-popular Egyptian Horus-Isis-Osiris stories with the life and deeds of the Pythagorean orator and healer, Apollonius of Tyana? Was the only strategy left to those Roman "Church Fathers", to "muddy the pool" and detract from Apollonius' message of personal sovereignty and direct communication with the great "Primordial Unity" [my term], and introduce (as seen in these other cults) an intermediary priest and a "saviour"? An Empire of course, can't extract funds off people when they are gathering in their own homes. Great churches and edifices needed to be built, to keep the weekly tithes rolling in, least the parishoners end up in "eternal damnation" !! Apollonius was widely talked about all across the Roman Empire for many centuries, even up until the 19th century, with continual suppression at each raising of his name. Vast quantities of literature concerning Apollonius have been burned. "lost" or "buried" along the way. Such was the reputation of Apollonius across the Roman Empire that even ordinary illiterate people could reference his wise teachings and talk about the healings he had performed in his lifetime. You can't hide a phenomena like that for long. I suspect the memory of Apollonius has lasted so long and has permeated into all of our future generations around the Empire (which still operates to this day and is now global, encompassing not just the Mediterranean), because Apollonius defied directly, one of the cruelest of the Roman Emperors to his face - Domitian !! Domitian personified all that was cruel and evil in the Roman Empire - a "man as god" who held the human spirit down, embodying an energy that still dominates humanity to this day in the guise of dead Corporations including Vatican Inc., the biggest business on the planet. And please remember: There was no internet back in the day (1-3 CE), no printing presses, no radios - so individuals had no way to publicize what was happening in their small village as this great philosopher, orator and healer swept through the Mediterranean world like a bottlebrush, getting into every corruption-filled little corner. The story of this strangely dressed man with his "revolutionary" ideas that burst like desert flowers from the topsoil of Pythagorean thought, would have spread around the whole Roman Empire like a purposefully burning wildfire (slow, none-the-less). This word-of-mouth teaching would, by my estimation, have taken around 200 years to permeate to all of Europe, the near East and the north of Africa. As they say, "you can't 'unhear' a thing once you've heard it", and the Pythagorean message of peace and personal sovereignty would have ripped into Rome's tough exterior like a truckload of TNT! "The preacher" had to be put down! - even posthumously. 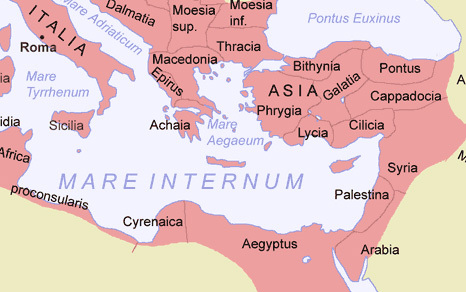 There were no inter-provincial systems in the Roman world, for recording or distributing any information besides the "Roman authorized version" for anything. So the message would have taken a very long time to trickle out. Once it did, the hearts of all people who heard this Pythagorean message, would have opened and embraced the sense of its reason and compassion. As we have now with CNN, ABC, BBC Fox News, et al., the Roman Empire, which I feel became centralized at the Vatican on behalf of the elite patrician families, certainly wasn't into disseminating the truth! The 'battle' was on... Who would win the propaganda war? The difference in our era is this: We Now See "Them" (the elites). We see the game! And we have amazing new technology available that allows us to see the tricks... "Know the truth, for the truth will set you free!" And that's a very good start! Keep spreading the Truth! The "revolution" will not be won by an individual standing as "saviour". The "revolution" is to be won by us all !! Please feel free to compare this image with other Apollonius of Tyana images on this blog. 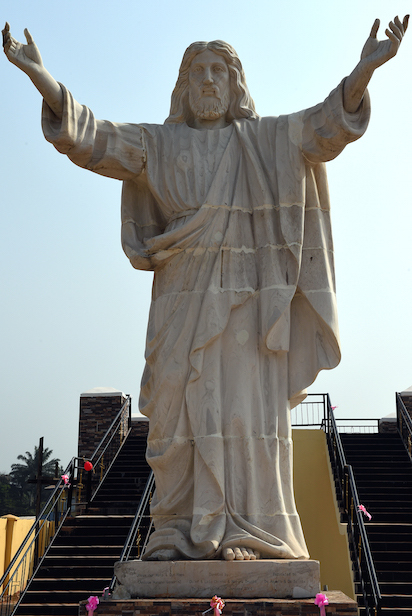 The Chinese sculptors of this barefoot Jesus got it right! This less European depiction of the Christus figure comes within a smidgen of the likeness of our historic Apollonius. A Jew with long hair? I don't think so.